Moretti’s Ristorante & Pizzeria is opening its eighth Chicagoland location at 3:00 p.m. Friday, September 8, 2017 at 9519 W. Higgins Road — the newly renamed Moretti’s Rosemont Plaza, one block west of River Road on the south side of Higgins Road. Moretti’s will offer dine-in, carry out and delivery, as well as full-service catering and hosted private events. Moretti’s specializes in classic Italian and American cuisine, Moretti’s 10,000-square-foot dining establishment will accommodate up to 200 people. Moretti’s Rosemont has 30 or more 65-inch or larger HD TVs. There is also a 50-seat semiprivate dining room, a 25-seat island bar, and seating for more than 150 people in the outdoor garden. There are three extra bright daytime-viewing HD TVs in a canopied bar area in the outdoor garden. Moretti’s will open 3:00 p.m. daily September 8 through September 15, and then transfer to full-operational mode with opening time moving to 11:00 a.m. Live DJs will play hits from 10:00 p.m. to 4:00 a.m. several nights a week. 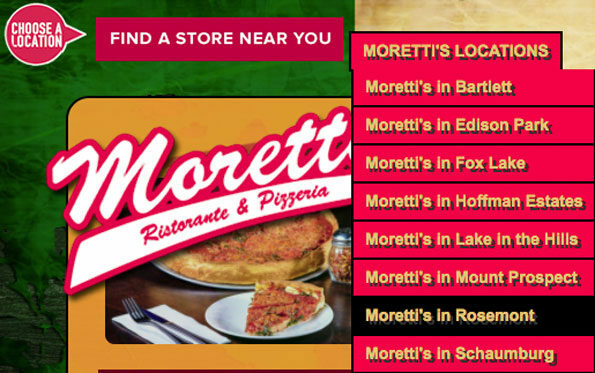 Moretti’s also has upcoming restaurants in Barrington and Morton Grove.